The sun was shining, the rain wasn't scheduled to hit until the afternoon, and I felt good and ready for a nice run through the trails. Oh how looks and feelings can be deceiving. Dog jumps on bed at 6:30am and wakes me up. Dog gets up again and whines loudly until I get up and let her out. I left for the race around 8:10. Traffic on the 401/410 was non-existent (thank goodness) and I got there in pretty good time, just before 9. Lots of people were already there, and the kids 3km race had just started as I pulled up. One of these days I will get my boy (and maybe even the girl) to run one of the kids races. I grabbed my bib, and picked up my race swag. 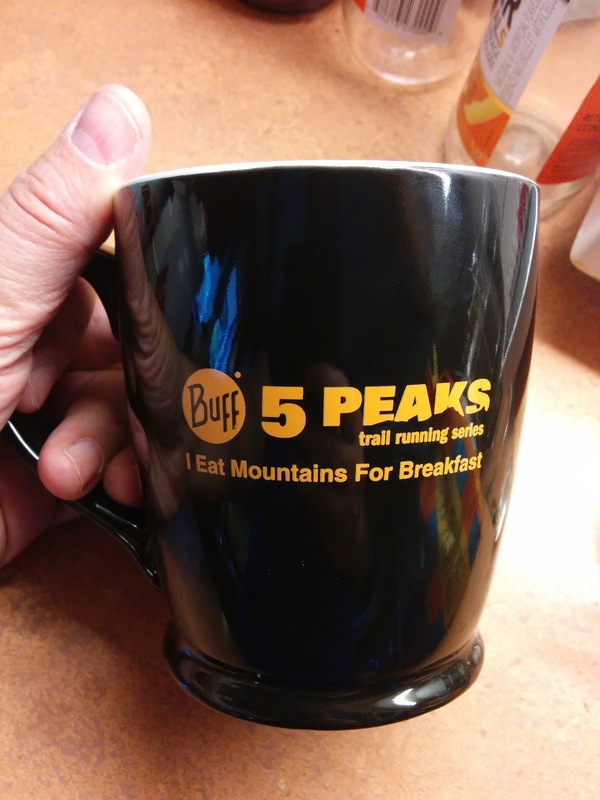 One thing I absolutely LOVE about 5 Peaks is the swag. They really like to mix it up. At the first race, I received a Buff, a cool head covering that can be worn in may different ways. This race, it was a choice between a silicone pint glass, or a mug. Being the ardent coffee drinker that I am, I picked the mug. I headed back to the car to go through my pre-race ritual. 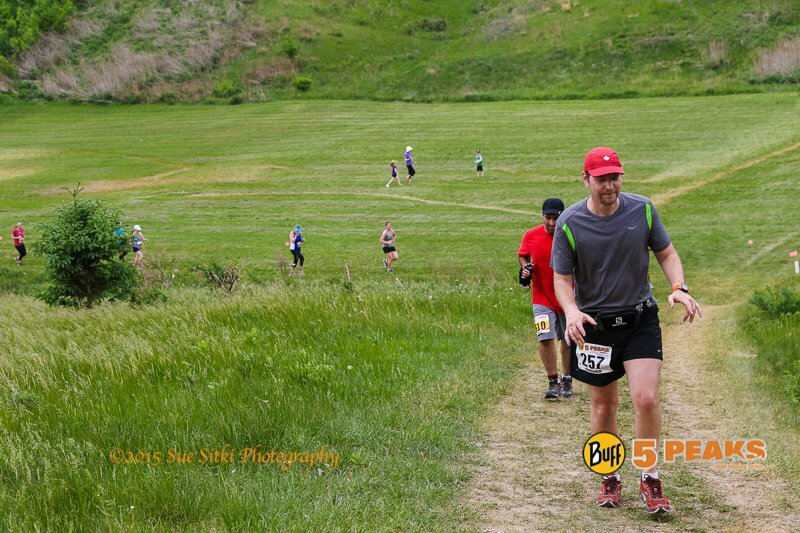 It was already hot at this point, and I decided to go with my bottle belt for the race. I also remembered to bring some gels this time. At the last race, towards the end, I ran out of gas, and figured with this race being 3-4km longer, I'd need something for sure. There were two water stations on the course, and I'd be hitting them twice during the race. Still, I wasn't sure whether that would be enough, so the decision was made to wear my hydration belt. I loaded it up, and went for a warm-up run around the parking lot. Half way through I noticed that on the right, the side strap was hitting me in the arm, in a way that I don't remember it ever did before. No biggie, I'll fix it when I get back to the car. When I did stop and look at it, I saw that it was actually RIPPED! My very first bottle belt, and it's ripped! I wasn't sure if the remaining stitching would hold up to the bouncing on the trails, so I opted to go with my other belt. No water pouch, but I'd just take the gels when I hit the water stations. I transfer all my stuff to the other belt, and go to attach the bib. This belt has two strings where you can easily attach the bib. I love this feature, as I don't have to safety pin the bib to my shirt. Only this time, one of the attachments is missing! At this point, it's about 9:38am, the race starts in 20 minutes, and I need to find some safety pins! Back to the bib pick-up I go, and grab some. I pinned the bib to my shorts, which worked out pretty well. 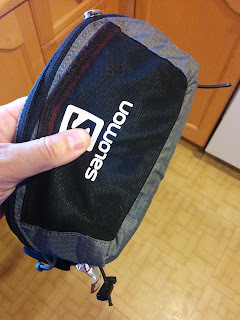 Belt pouch packed, bib fastened, sunscreen applied, I was ready to race. But, with all these equipment problems I was not in a good frame of mind. Ever had something really minor and seemingly inconsequential really bother you, like a sliver in your finger, or a rock in your shoe? Yeah, that was what this was like. 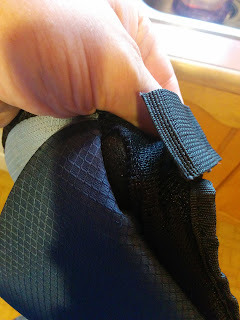 It sounds silly now, but that missing fastener on my belt REALLY pissed me off. Not a good way to go into starting a race. I mingled around the start, waiting for the race to begin. The Sport and Enduro races start in waves, about 3 minutes apart. With the trails being double- and in some places, single-track, it's a smart thing to do. I put myself in Wave 5, the last one, knowing I was going to be one of the slower people. The organizers combined waves 4 and 5 since 5 didn't have that many people. I saw my friend Axel up at the front, looking all twitchy and ready to kill the course. Good luck dude! After some last minute instructions from the race director, she let us loose on the course. This course was two loops of approximately 8km, around Heart Lake. We started off running on a gravel road directly next to the lake. I tried to settle down, and lighten up. I even hammed it up for the photographer taking pictures on the road. Soon, we were into the trails. I felt good at this point, happy that I'd taken the time to warm up a bit. I'm trying to take the time to do a proper warm up before races. I didn't always do this; in fact, I almost never do. Not sure why. Normally when I run races, I always feel like crap for the first 20 minutes or so, until my legs kick in. Why I never warmed up before, is beyond me. The humidity at the start of the race was stifling. Man, was it HOT! In the trails, with the air being still, it was like a sauna. I've run well in the heat in the past, but I guess it's been a while because I started to get very uncomfortable. I felt tired, more tired that I should. I managed to slowly run up some of the hills, but before long, I was walking them. By the time I hit the first water station, I was DESPERATE for a gel. I sucked it back, with some Gatorade and water, and soldiered on. Pretty soon after we started, I also realized that due to the gear issues, and last minute belt switch-over, I hadn't done my usual pre-race bathroom stop. By the time I'd reached the first aid station, I really had to go. Not that big a deal on a trail race right? Just step off the trail, find a nice secluded tree, and go. I ended up going to an outhouse in one of the campsites we ran past. Just another thing to eat away at my mental fortitude, which was starting to get really low. Between the heat, my feeling of exhaustion, and still dwelling on the gear problems, I wasn't a happy camper. Pretty soon I was walking the flat parts too, and before long, those really bad thoughts started to creep in. Why am I doing this? Why did I sign up for this torture? I could be at home relaxing with my coffee instead of killing myself out here. I should just quit. Who cares anyway? My biggest problem is that I have such high hopes for myself, but forget that to achieve glory requires you to put in some hard work. I haven't been training particularly hard these last few weeks, and it really came out in the race. All the hills, and trail runs, that I'd told myself that I would do in training, simply didn't happen. You can't just show up for a race and miraculously have a great result. I have all the excuses down too. I'm too busy to work out today. I can't get away from work to do my lunchtime run. It's too dark/cold/wet/warm to run today, I'll do it tomorrow. There's a bunch more but I'll spare you, the reader. It comes down to laziness. I was too lazy to do the work required, and now I'm reaping the rewards (or lack thereof). Despite my extremely negative thoughts (I even contemplated a short swim in Heart Lake at one point), I soldiered on. I've never DNFd a race (DNF=did not finish), and to do that would probably be the end of running for me. I was too stubborn to quit. Even if I had to walk the rest of the course, I would finish it. I tried to think of the race as just another Sunday run through the woods, that it wasn't really a race. Tried to make it fun, and enjoy my surroundings. I started to pick up the pace a bit, and was feeling a bit better. Around the 12km mark, my right calf started cramping up. Awesome. More walking, some stretching, some running. Wash, rinse, repeat. Towards the end of the race, some dark clouds started to roll in, and a few sprinklings of rain began to fall. I love running in the trails in the rain, so this made me feel better. I walked and ran and walked and ran some more, and before long, the finish was in sight. A short run up the dirt road, and I was DONE! So. Where do I go from here? There are 4 more races in the series. Are they all going to feel as bad as this one? No, they aren't. The next one will be better. I will work harder than I have, and have a better day. I'm putting it out here on the blog, for all to see. I'm tired of having bad races. I'm not looking to win, or even place. Just to not feel so exhausted and lifeless during the race. I want to enjoy myself, and tell myself at the end that I did my best that day. In 3 weeks time, we'll see. You can view my race results here. They aren't pretty. Thanks to Sue Sitki Photography for the pic! Hey found a dead link on your site. Please email me back and I would be happy to point them out to you.